These days I go to museums not to bathe in vague inspiration but to collect visual ideas and absorb technique. I still enjoy myself, but I notice I am picking out specific parts of a work that interest me, and that I could duplicate in my own images or design work. August, 2009. My feet were shocked into stopping in front of N.C. Wyeth’s Portrait of Ann Reading, on loan to the Farnsworth Museum in Rockland, Maine. A bucolic enough scene—but still a bolt from the blue. Instead of composing around obstructions, why not put a porch post smack in the middle of your painting? Two distinct spaces are created. In the foreground, like the open leaves of a book, the porch splays unrealistically wide, framing Ann and her dog at rest. Like the prow of a ship, the porch is poised to cleave through the blue vista beyond it, which opens out in more realistic perspective. Everything in the painting is hushed and still, but visually it is exciting and dynamic. Wyeth’s technique of ordering a work around a central obstruction went into hibernation in my brain. 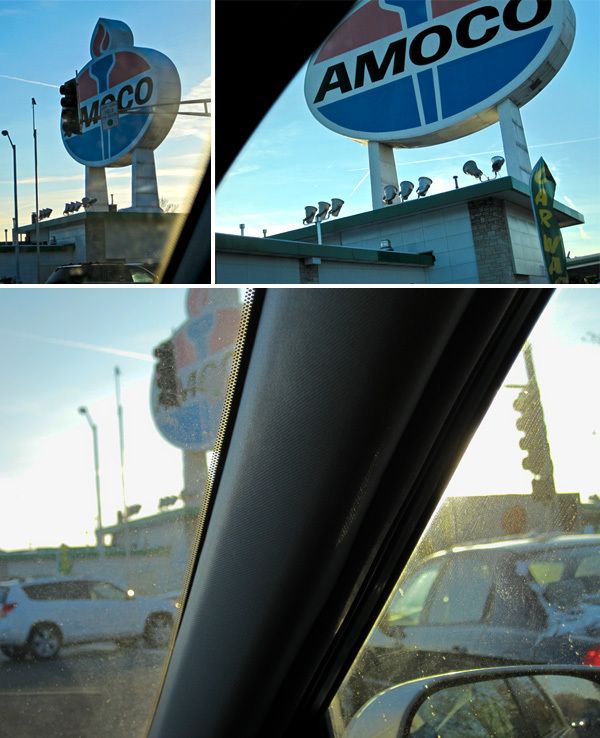 Until, over Christmas in St. Louis, I attempted to shoot photos of a goliath Amoco sign from the passenger seat of a moving car. I felt the shot slipping away but, remembering the painting, decided to keep shooting at an unfavorable angle. With good result. Now, my point-and-shoot pic is not as good as Wyeth’s painting. For one thing, the photo compresses all the space into one graphic plane. Nothing unfolds as you look into the image; it’s all on the surface. It isn’t meaningful. Because images that POP are often FLAT. I’ve realized that a major advantage of using illustration instead of photography is expressive perspective. You can guide the viewer’s eye more freely when you are dealing in invented space. Of course, a skilled photographer also knows how to do this. As a designer, I would like to improve my technical understanding of both photography and illustration. I enjoy creating them myself, but I need to recognize when someone else’s work is better, and cultivate the skills to art direct them effectively. Meanwhile, I’ll keep learning by stealing.